Who doesn't love cupcakes? These are the only cupcakes I will be sinking my mitts into at the moment. No calories in these ones. Grab the free pattern over here. 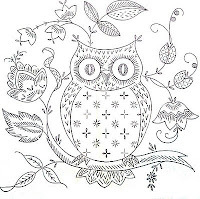 You owl lovers have to get over to Stitchy Britches for the cutest owl stitchery.....I love it. This is not the version to download. You need to get over to Stitchy Britches to save it. Sew Ritzy has a pretty ritzy fabric flower tutorial over on her blog....another flower to add to the list girls. This cute Messenger/Tote bag can be used for lots of things. Homespun have a bonus project designed by Kate Hampson and Jo Hercus that you can download. 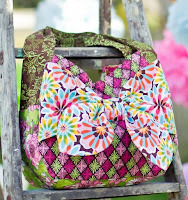 Robert Kaufman have a free pattern called the Luscious Bow Tote. I like this but I myself don't do bows, so would omit the bow. 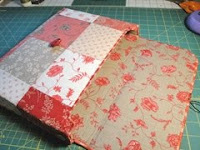 Terrie over at Bits and Pieces has a tutorial to make a File Folder. Looks pretty nifty. 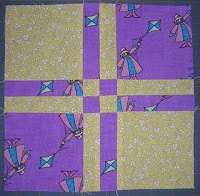 Willy Nilly has a quilt tutorial called Value Quilts....using light, medium and dark shades of fabric to make up a nifty looking quilt using 6" squares. Great way to use up that stash. Mandie from Life in the Craft Lane has a heap of graphic freebies to grab. 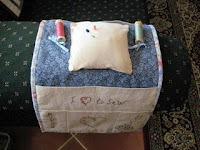 Julia has a tutorial for a cute Sewing Caddy on her blog. It has a sweet bluebird stitchery on the front and perfect for your armchair. Shirley has a tutorial for a cool looking block called the Exploding Pineapple block. Take a look. 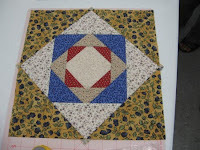 Not the traditional way to make a patchwork block but how cool....and it looks so easy. Krafty Panda has a tutorial to make mushroom pin toppers....looks pretty easy...well I am hoping so as they are cute and I haven't done this before but would like to give them a go. Lettie from Polka Dot Pineapple has an easy peasy pincushion to whip up. Take a look. 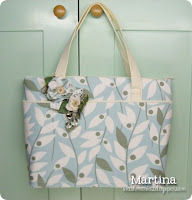 Confessions of a Sewing Addict has a tutorial for a lovely hand bag you can download in PDF form. 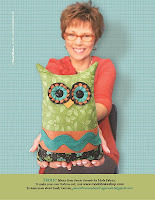 Sandy Gervais has got an owl freebie pattern over at the Moda Bakeshop to grab. I love the Frolic range of fabric and of cause this owl has to be a winner. 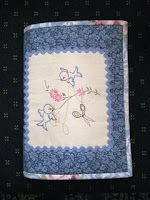 Caroline is having a free Block of the Month Stitchery over at The Contented Quilter. This is a really cool block. So easy and yet so effective. Thanks to Sew Wonderful for a great idea. 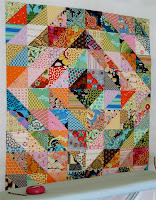 CrazyMomQuilts has a tutorial over at the Moda Bakeshop called Stacked Coins Baby Quilt. I really like this simple effective use of charm squares. Cottage Quilts has a free hearts table runner that is really nice and looks nice and easy to make up. 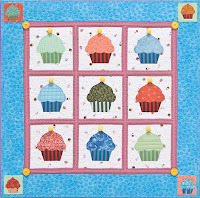 Moda Bakeshop have a lovely quilt called Sunday Squares that I think is really nice and would love to make up. It was so lovely getting such lovely comments from 220 lovely readers. There were a couple of late comments that I couldn't include...sorry...but they came in after midnight South Australian time. Anyway, on to the winners.......yes winners....I decided because we actually hit the 100,000 visitors I would also give away another 2 fat quarters as well as hitting 550 followers I thought why not give 3 lucky winners a little surprise. Then I must have felt good about giving so I decided to give a 4th prize to a lucky reader. I will send an email to you girls. Please contact me with your mailing address and let me know what fat quarters you would like me to send you. I would really love to say a big thank you again to all the lovely readers who left such terrific comments. It means a lot to me and to know the work I put in here is appreciated. WOW - today Freebies For Crafters hit the big 500. This is amazing for the short time we have been collecting all these great free patterns and tutorials. Thank you to all the readers out there for your support and also to all of the wonderful people out there that are willing to share their knowledge and ideas with us all. To celebrate 500 Followers I am giving away 4 fat quarters and a little extra surprise. 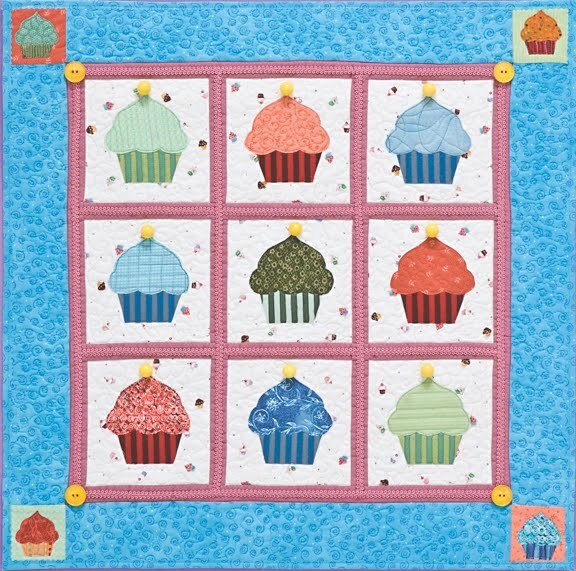 You will get to choose which 4 fat quarters you win from my Oztion shop. Please leave a comment on this post only. This giveaway will stay open til the midnight South Australian time on 1st of March and is open to everybody. I will draw the winner on the 2nd of March. p.s. while this give-away was on we also hit 100,000 site hits...woohooooo....well done bloggers...you all rock!! !